I was 17 when I applied for a competition in college For Vegetable and Fruit Carving. I entered without any knowledge and training but coincidentally I won that contest. I got those ideas from a marriage function I had attended a day before. But my curiosity didn’t stop to learn more and more about this art. 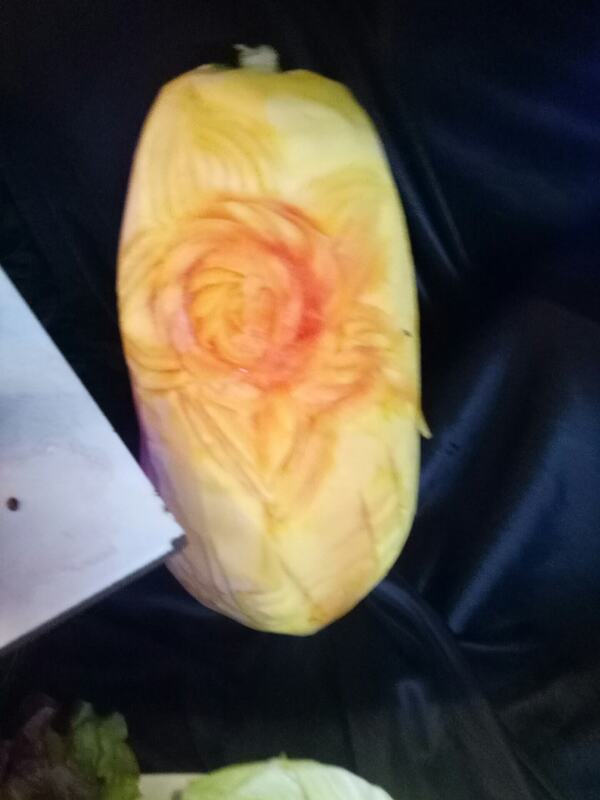 And I tried in hobby classes for Vegetable and Fruit Carving. On a very first day, I realized that this is not easy as it looks. You need to have a 3D vision when you’re on the particular fruit. I first admired those intricate and sort of unique designs which my teacher taught me and gave a good try at home. So, I couldn’t sleep that night as I was highly fascinated by those colourful decorations and such innovative patterns, flower designs. I had seen a rose made out of a watermelon, a leaf out a cucumber and some of those weren’t particular fruits or objects, just pretty to look up to. 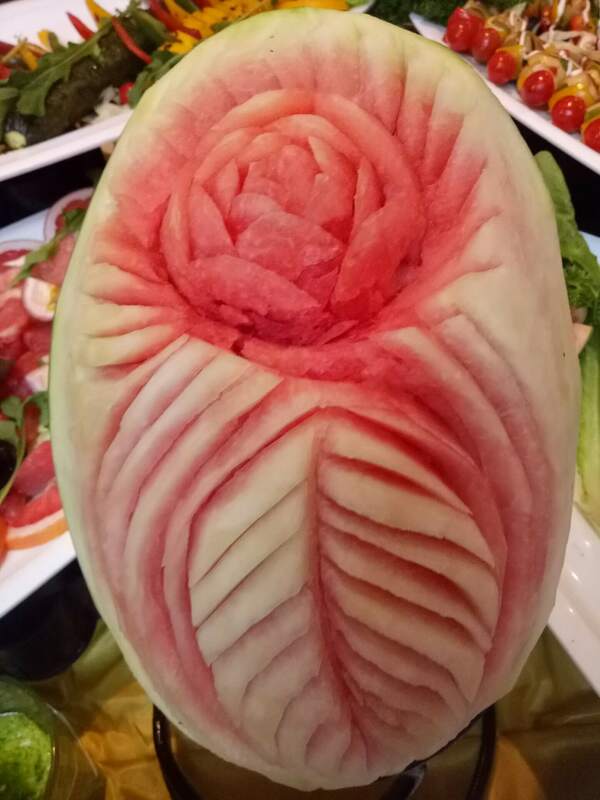 And I was damn curious to learn on the same night and as a young teenage girl, I wanted my career with this fruit carving. After Mom dozed off, I pulled a fruit out of the fruit basket and tried my hand to make a flower out of an apple, only to get a cut on my little finger. I tried a number of times but I couldn’t get the right way to do it. And as you are aware that when we do not understand the know-how of a particular thing, we do not succeed at it. That night, after applying the ointment, I dozed off too. Today when I see the images of those patterns on fruits in a magazine or any restaurants I recollect my those old good days of art. The curiosity has again aroused in me and wants to learn again to Master the art. So let me you tell you in detail. Carving is an art in itself. Vegetable and Fruit Carving is the art of carving fruits and vegetables to form beautiful objects, such as flowers and birds. Nowadays, people also carve out faces of people, animals, monuments and a number of different objects. The art of Carving originated in 14th Century in Thailand. This form of artistic expression is applauded and loved in Thai culture, China, Japan and presently in many parts of the world. Now that we know what is Fruit and Vegetable is all about, keen people like you and me would love to try a hand at it. 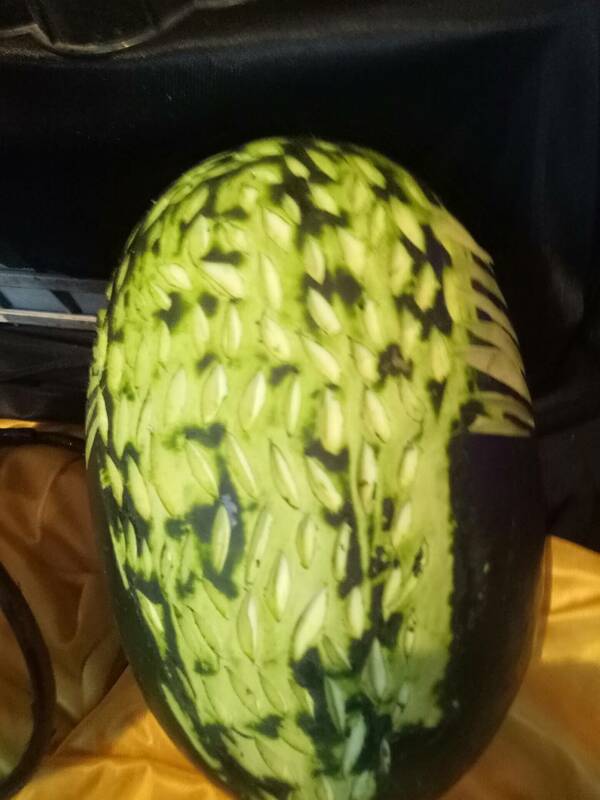 HOW TO DO Vegetable and Fruit Carving? Artists carve out astounding shapes and designs. You require a sharp knife and a fruit or a vegetable of your choice and with enough practice, you and I can easily carve out attractive decorations and patterns. There are special tools to design this carves. You have two main basic knifes for 45degree and 90 degree to carve design. – Take a large cucumber and cut it a third from the end or a small cucumber into the half. – Now, take a sharp knife and slice off the outer-covering into strips, leaving all the strips attached to one end of the cucumber. – Make some more strips the similar way until the outer-covering forms ‘outer-petals’ of a flower. – Now as we slice off the white flesh of the cucumber, we form the inner white petals of our cucumber flower. – Remove the seeds and the centre of the cucumber using your knife. – Now, add a colourful centre of the fruit, probably a small cherry or a berry, a circle of tomato or even an actual flower will do. For now, you and I know a simple carving method and much more can be learned if you invest your time and do enough practice. 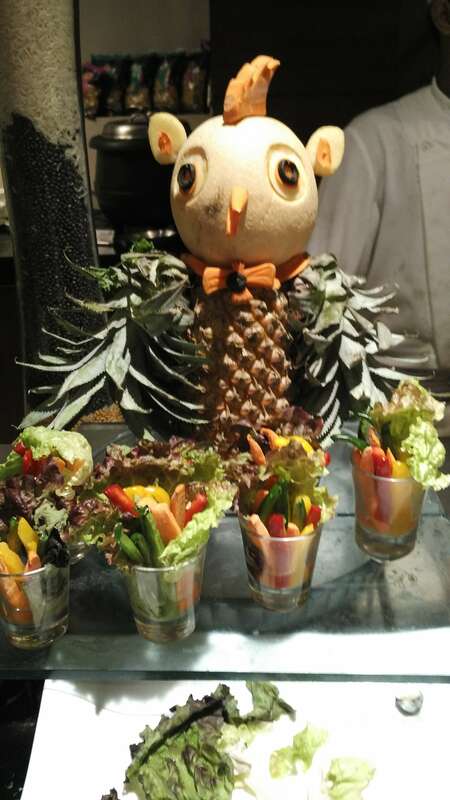 Vegetable and Fruit Carving: HOW APPEALING IS IT? 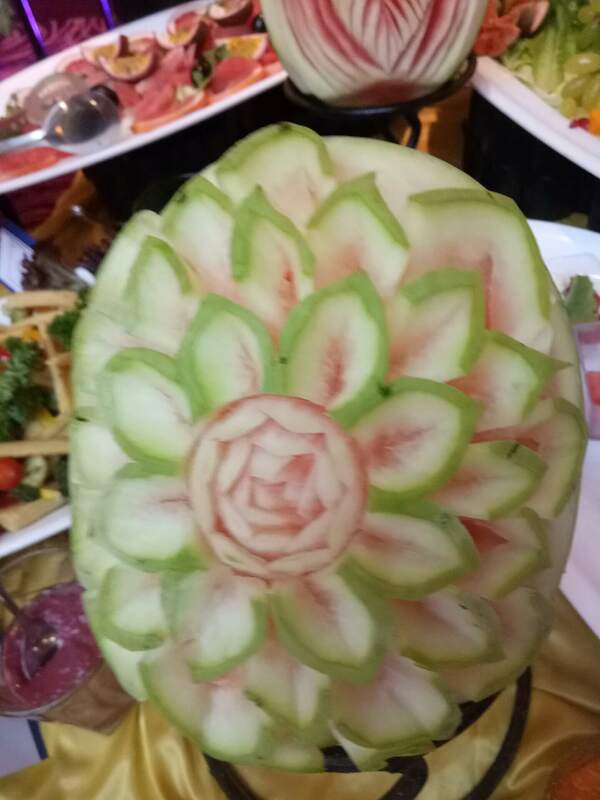 The art of Vegetable and Fruit Carving has become increasing popular in real life when we visit luxurious and magnificent hotels as well as on television cooking serials as food appeals to both to our eyes and our taste-buds. 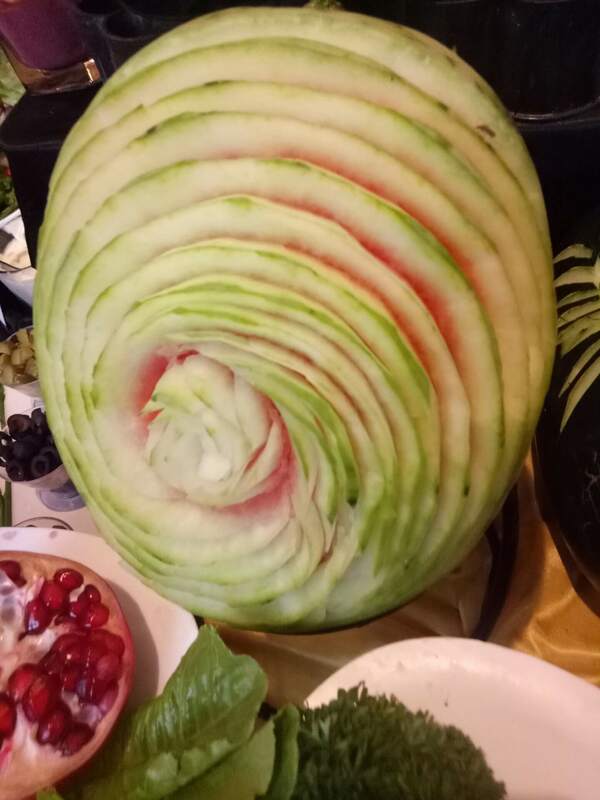 Carved fruits and vegetables are being on display at the weddings, birthdays, private parties because they are kind of eye-candy to the people of all ages. 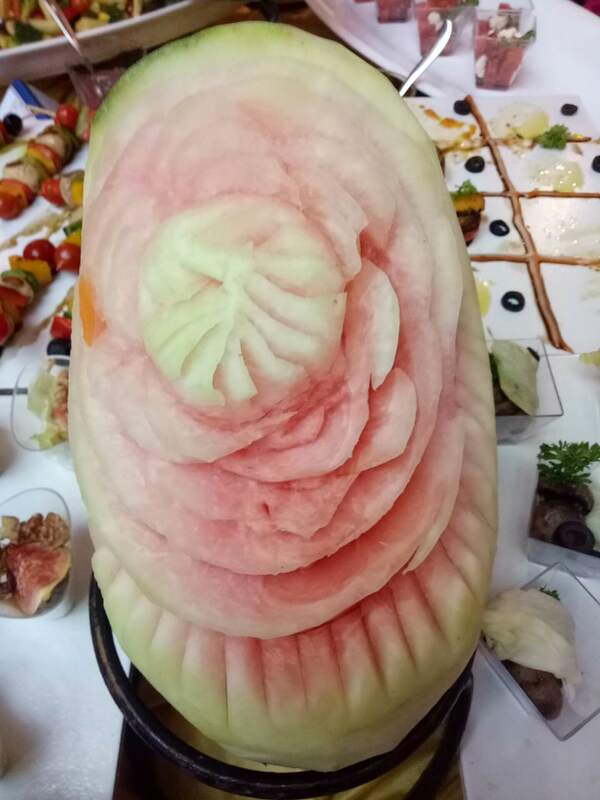 Many times, the food carving seems so admirable and eye-pleasant that we resist to eat it and simply take in the beauty of it. Vegetable and Fruit Carving has been and shall always will a breath-taking and a mind-boggling art. Check out some images clicked by me recently in New year party and some are made by me. You have magic in your hands ? So fascinating, I am eager to try carving too. Wow! I was always fascinated with this art form! Thank you for sharing about it in details! ? These look so great. Must have taken a lot of time. Thanks for sharing the details. I can at least try to do something like this. Awesome and accolades to the artists who do these fruit and vegetable carvings so beautifully. I would love to learn it. I’m fond of vegetable and fruit carvings as well. These carvings look artistic and perfect. Will definitely try making a cucumber flower! Wow… U gave fruits a new life through this art, I will surely try it and teach my daughter. Wow, I always use to be in complete awe of the fruits and vegetables when I saw them functions and parties. The way they used to be well cut and decorated. In fact, I wanted to try this myself and could make a tomato basket max. I loved reading this post and will definitely try out at home. This is an ART! would love to try it but I am sure it will take many tries before I finally get it right! This is so artistic, appreciate the efforts taken to create such beautiful art pieces. This is fascinating art form indeed .But needs training and patience .Loved the pics . Thanks for sharing such an informative post, was unaware of when it started and thanks for sharing those tips!